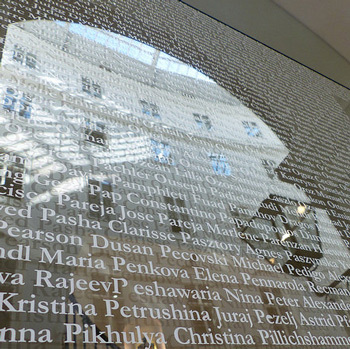 The installation in the atrium of Webster Vienna's Palais Wenkheim includes the names of 2,986 alumni from Webster's 35 years in Vienna, as well as skylines from Webster locations around the globe. With Webster University celebrating 35 years in Vienna, a new art installation in the atrium of the Palais Wenkheim includes the names of all 2,986 alumni from the Vienna campus as part of a seamless skyline featuring landmarks from Webster's campus locations in Vienna, Leiden, Geneva, Athens, Accra, Beijing, Bangkok and St. Louis. 35 years in Vienna and the connections among Webster's campuses. Designed by Seth Weiner, adjunct faculty member at Vienna since 2014, the display offers visitors a stunning visual reminder of the connections among alumni throughout the campus network. Check out more photos of the installation in this Webster Vienna story or in this Flickr album, and share via this Facebook post.